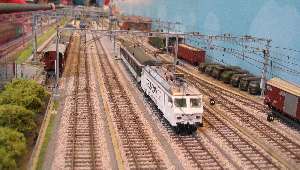 This site is for all enthusiasts of Swiss Railways, especially those in the Manchester and north-west England area. Perrapswil, 12' long at home & 18' at exhibitions, was built to replicate the traffic at Rapperswil, a Swiss SBB station at the southern end of Zurichsee. Here there is a fairly intensive service of S-bahn trains (mainly the blue and grey double deck stock) together with short regional expresses giving a variety of liveries. The original station was far too large to model accurately in the space available and huge liberties had to be taken taken with local geographical features as well as the track plan. 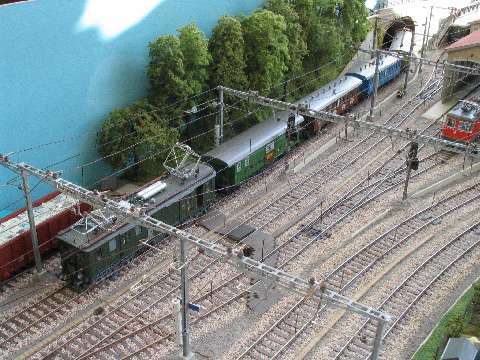 The tight curves employed to fit the model into the "railway room" meant they needed disguising with non-prototypical features at each end of the scenic sections. Although not an exact copy of Rapperswil, hence the name and pun, the buildings, all scratch built, I hope, bear close similarity to the originals. Track is Peco Finescale & Peco point motors operate all the points via diode matrices. Sommerfeldt masts are employed for the overhead along with their finescale catenary and some homemade (at each end). Signals, which again make use of diode matrices, and relays for the dwarf signals, are by Schneider. Rolling stock is mainly a mixture Roco, Lima, Liliput, Trix, Brawa & Hag with the occasional specialist item. Most of the trains featured are from the Swiss Federal Railways, Sudostbahn and Bodensee Toggenburg Bahn of the period1995-98. The aim is to always have something for the viewer to see whilst remaining reasonably prototypical. One shunting loco uses overhead power and thus can work anywhere in the station without the use of section switches. All the signals work, the main signals being set manually whilst the dwarf signals are linked to the route selected. 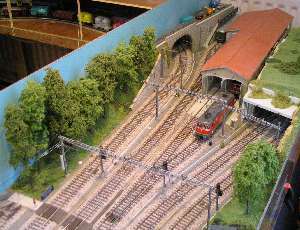 The layout was operated in the main by Manchester Branch members of the Swiss Railways Society.